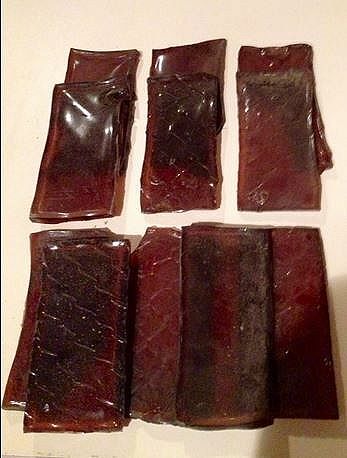 Hide glue wafers, to be broken up, soaked in water overnight, and then heated in a glue pot the next day. 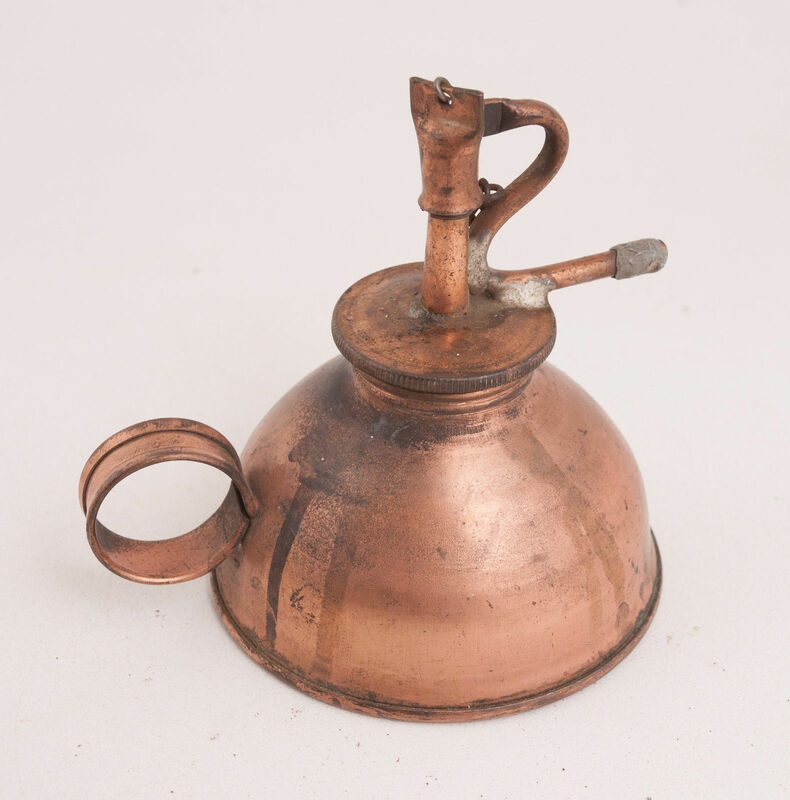 This is the product that the craftsperson would receive from the beginning of industrial production of hide glue, starting around 1800. 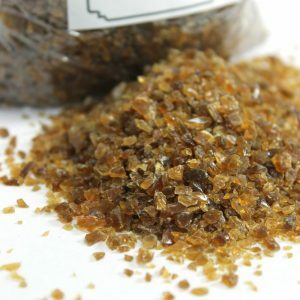 Granular form of hide glue, as we have come to know it today. Use of hide glues in piano construction and restoration have essentially been the universal adhesive right up to the advent of World War II. Postwar, PVA or yellow wood glue, epoxies, contact cements, and CA glues were adopted for various specialized uses. 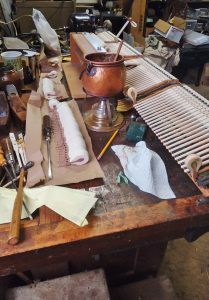 But modern piano technicians, restorers and repairers, keep returning to hide glues because of its reversibility and lack of creep, or movement under stress. While one can make a glue pot with a modern adjustable hot pot for cooking purposes very cheaply, it is instructive to look at the ways that hide glue was kept in its fluid state historically. After all, some of the best pianos and musical instruments ever made were produced without an electrical dial to achieve a 140 degree F optimal temperature. Historically, glue temperature was moderated by using a Bain-Marie, or double pot, with water in the outer pot, and the glue in the inner pot. 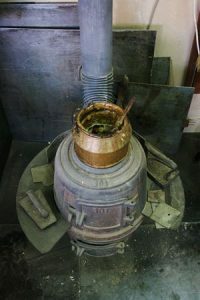 Variables in controlling the temperature of the hide glue would include the size of the outer pot in relation to the inner vessel, the intensity of the heat source, the distance from the heat source to the outer pot, and the amount of time the heat source is engaged. 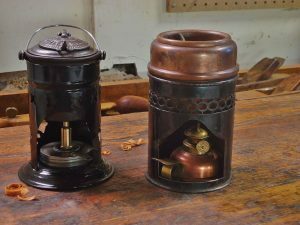 Sources of heating the glue would include wood or coal shop stoves, open hearths, gas heaters, alcohol and kerosene lamps, and steam tables. 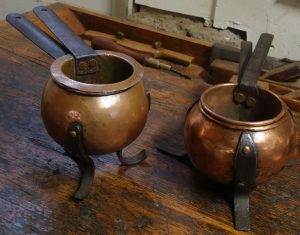 Two smaller globular shaped French glue pots with legs. The legs serve as an extra buffer between the heat source besides the water-filled outer pot, and the hide glue. 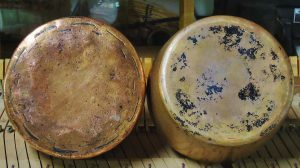 Lids were often made by the artisan, since those discerning enough to use hide glue would naturally be inclined to make one. Or at the very least, to improvise a cover. Glue pots have come in many forms, and made from a variety of materials. Early on, and up until the time of Christopher Gabriel, a major London tool and wood supplier from 1770 to 1822, many glue pots were made of lead, and were a single pot only, not a bain-marie. 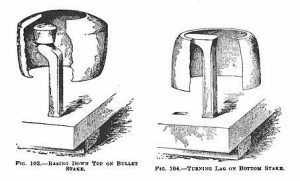 Lead had the advantage of retaining heat very well, giving the worker time to transport the glue away from a heat source, to the actual location of the bonding operation, if the work could not be moved adjacent to the heating source. 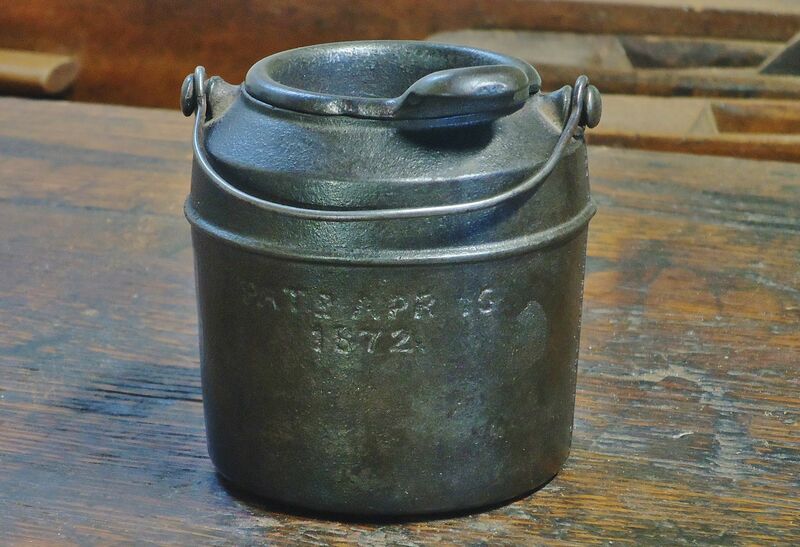 In the United States and Britain, with the development of the cast iron industry in the early 1800s, glue pots were a logical candidate to be cast from iron. 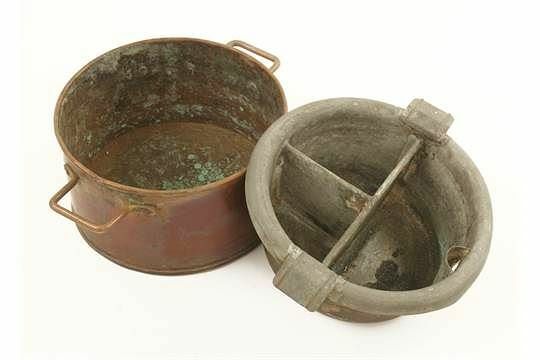 Iron distributes heat evenly and holds it–and mass producing these pots was relatively inexpensive–making them affordable to a wider market. 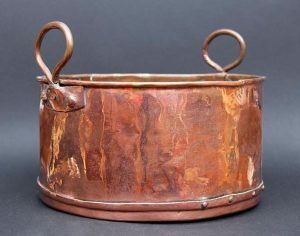 Copper glue pots were prevalent in France starting in the 1700s, and to a lesser extent in England and the United States. Copper was used because of its ability to conduct heat, which means that the metal heats up quickly. Its also true, though, that copper releases heat just as quickly. 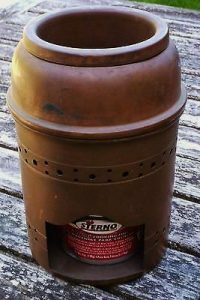 But this is obviated by the use of an outer pot containing water, which holds the heat much longer. 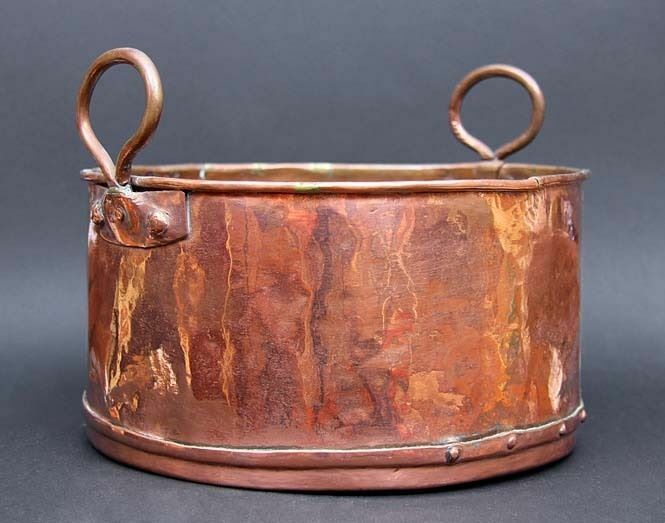 These pots were often made by individual coppersmiths, or in workshops, such as those within the copper making community of Villedieu, France. Many variations of construction can be seen in these pots historically; joining methods employed would include dovetailing, overlap dovetailing, folded joints, riveted joints, and soldering. 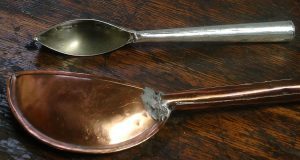 The coppersmith would start using flat sheets of copper, bending and planishing into shape, using the above methods of joining. 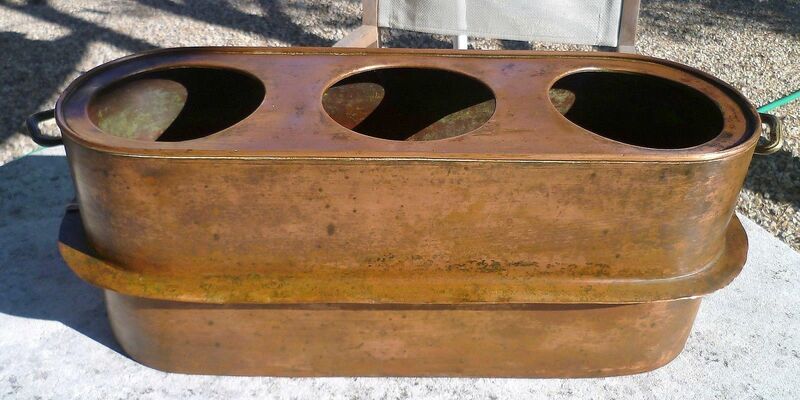 Other pots utilized copper sheets compressed into iron or steel forms, then the various components would be brazed together. 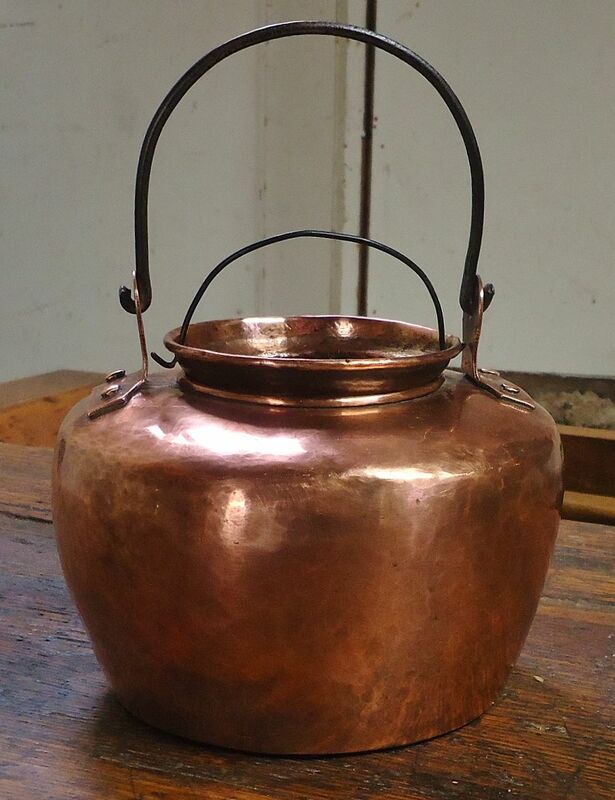 Some copper pots would be made of ‘bright copper,’ meaning that the level of finish would be as refined as teapots and other copper vessels for the table and in cooking. Others, however, would be completed with less attention to detail, with an eye towards sturdiness. 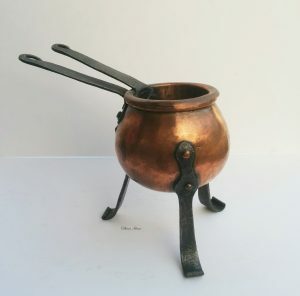 In England and the United States, starting in the mid 18th century and to the late 19th century, a significant number of copper glue pots were made just like teapots, with the exception of a spout and the addition of an inner pot for the glue. A glue pot/teapot in search of an identity. This one appears to be cast iron, though. “A Late Victorian Silver Glue Pot. Rupert Favell. London 1892. 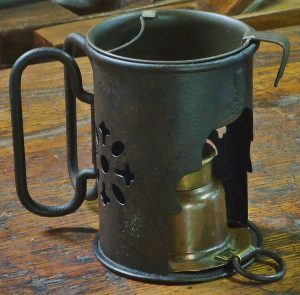 In the form of a churn with swing handle. Complete with interior glass liner. 5cm high. 4.9cm diameter. 51.6 ounces (of weighable silver).” From the saleroom, London Auction Rooms. May 2015. Vase shaped copper glue pots, from France. Small one is marked 00, its less than 3 inches tall; large one is 4 1/4 inches tall and marked 3. 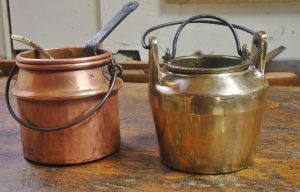 It appears that France had a size index for glue pots that differed from England. Three inch English glue pots usually were a size 7. Old glue pot for hide glue. Hide glue still has many applications in piano work today, for many reasons. 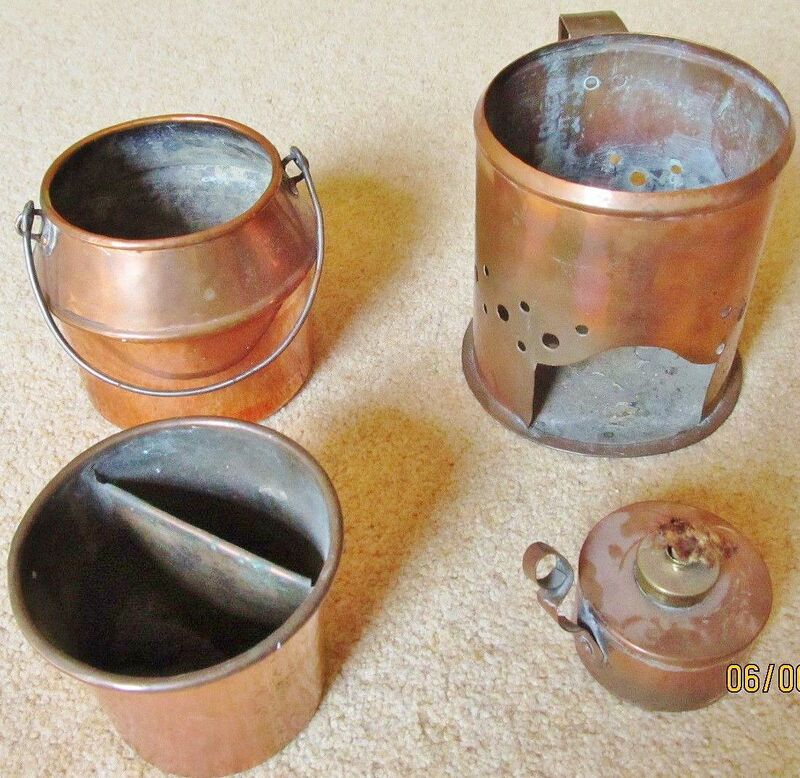 Its rare to find these antique glue pots with burner, heating shroud, and double copper pot. But this is the complete set up, and its how they were used in old piano factories, along with steam tables. 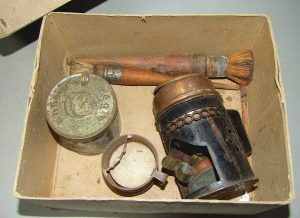 French hide glue kit, as found by Patrick Leach. Includes glue pot, hog bristle glue brushes, tin container for glue granules, and handle for copper double boiler. Photo from Patrick Leach. French glue pot, disassembled. Heating shroud, outer boiler, inner boiler, and alcohol lamp. Hide glue has many advantages, including the ability to control working time, or the timing of the setting process with urea. With heat and steam, the bond can easily be broken and cleaned; this is very useful during the replacement of some piano parts, and the retention of others. 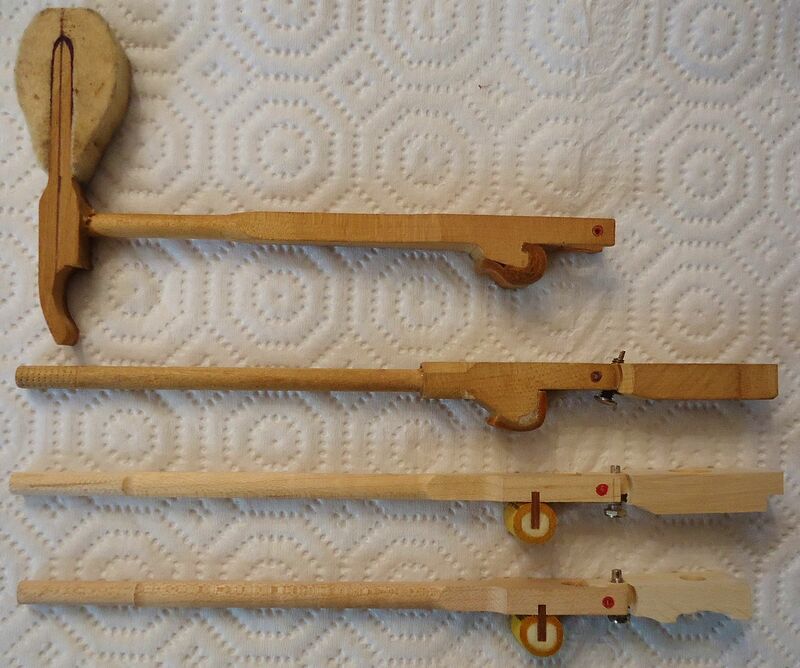 An example of this would be the hanging of multiple sets of hammers on the same set of shanks over the lifespan of the piano, especially when the original shanks are obsolete, such as a set of Thayer shanks. Multiple replacements of key bushings are another example. Also, hide glue is not as vulnerable to dry flow when compared to modern yellow wood glue or PVA, which can be subject to movement of structural components under shear stress load. Top to bottom: obsolete Thayer shank with hammer; Thayer shank & flange; Knabe type shank & flange, with conventional knuckle; Steinway type shank & flange, also with conventional knuckle. Thayer was an Illinois-based piano action company. Picture provided because no images of Thayer grand parts are readily available online. 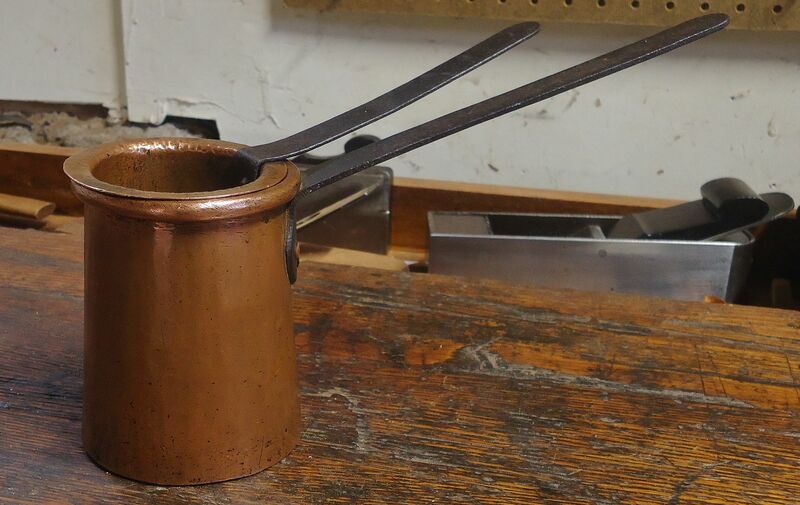 Hanging a set of Ronsen hammers with antique French bain-marie gluepot. 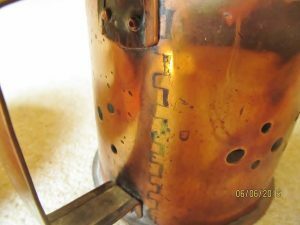 When using an alcohol burner, do not fill more than 60% full of alcohol fuel, wipe away excess fuel on the outside of burner. Never leave burner unattended, and keep a thermometer around to ensure glue does not exceed 140 F. Using this old ‘pot a colle’ does not slow down the work. Glue pot with alcohol burner underneath. 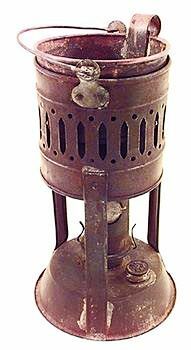 “Unsettled Market; Prices are subject to change without notice.” (1905) The triangular vents or flues are for use with an alternative kerosene burner which does not burn as cleanly as alcohol fuel. 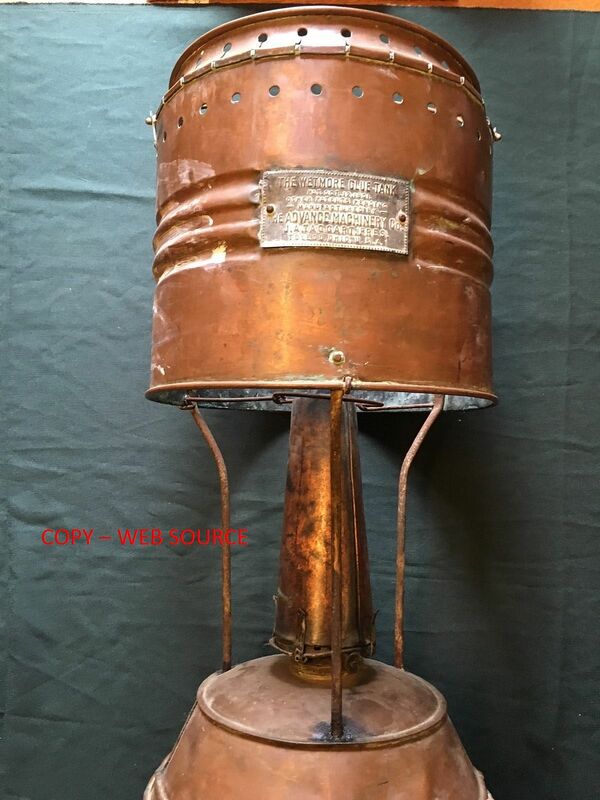 Large lamp glue pot. Photo from Federicio Ponchia. 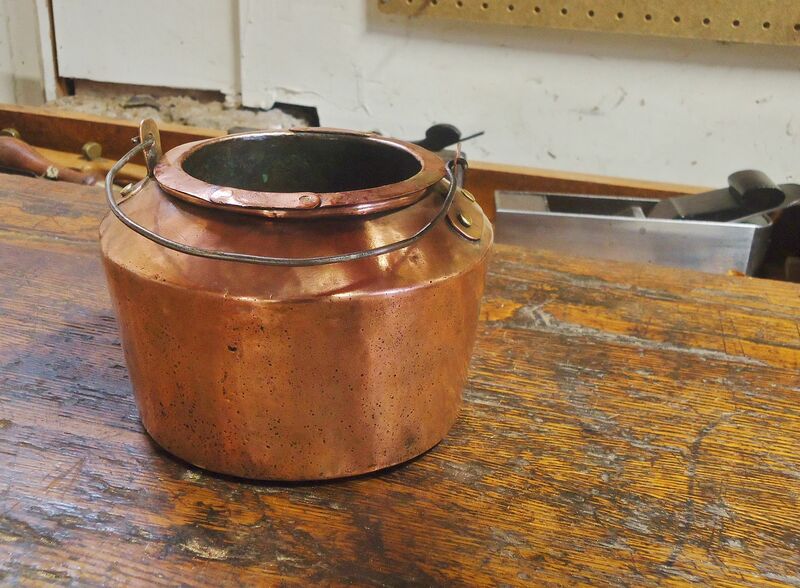 View of copper glue pot showing separate compartments for strong glue, and less strong, more diluted hide glue. “French cabinet makers use a glue pot with an inside pan made of glazed earthenware and divided radially into three divisions, in one of which is kept strong glue, in another weaker, and in the the third, water only, with a brush or piece of sponge for cleaning off superfluous glue from the work” From “The Practical Cabinet Maker and Furniture Designer’s Assistant,” by Frederick Thomas Hodgson in 1910. 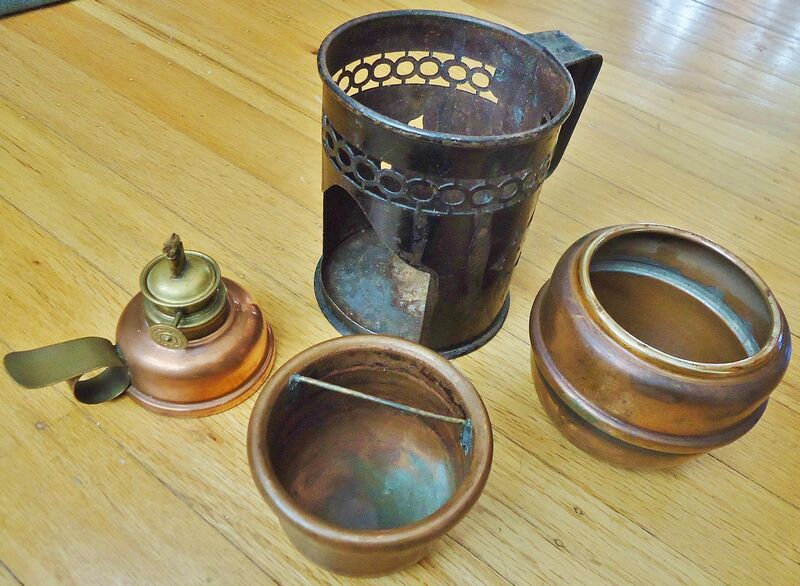 All copper hide glue setup, including alcohol burner, heating shroud, outer pot for water, and inner pot for glue. 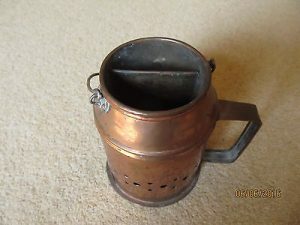 This French glue pot was found in England. Hand peining/hammering visible on outer pot. Large glue pot. H.S. 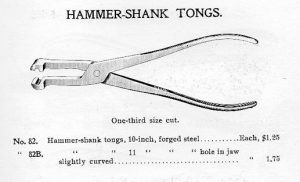 & Co., N.Y. pianomaker’s catalogue, 1885. 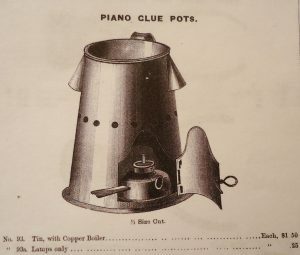 A very similar glue pot was illustrated in Seiver’s “Il Pianoforte…” published 1866 in Italy, but this book described piano making as it was practiced at least several decades earlier than that–back to the days of Fortepianos. From “L’Art Du Menuisier,” by André-Jacob Roubo. Published in 1774. Excerpt from plate #299. Early lamp glue pot. From “L’Art Du Menuisier,” by André-Jacob Roubo. Published in 1774. Excerpt from plate #334. Early lamp glue pot. 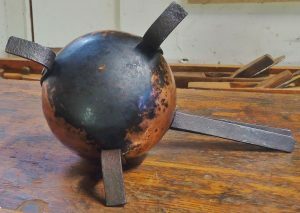 18th century french gluepot. From internet source. 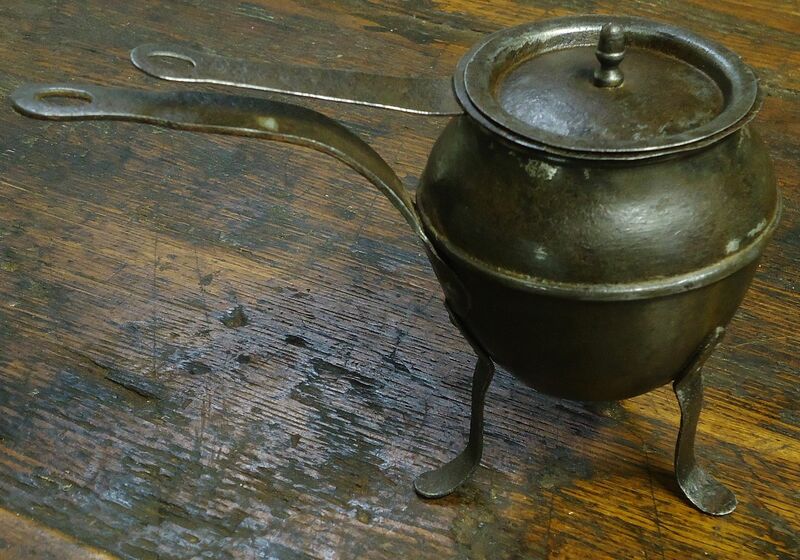 18th century French gluepot, with stirring.applicator tool. From ebay France. H.S. 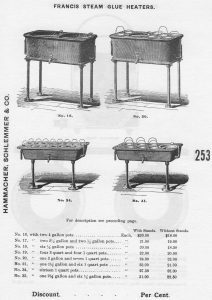 & Co., N.Y., 1885 catalogue. Small hide glue pot setup, for the traveling tuner. 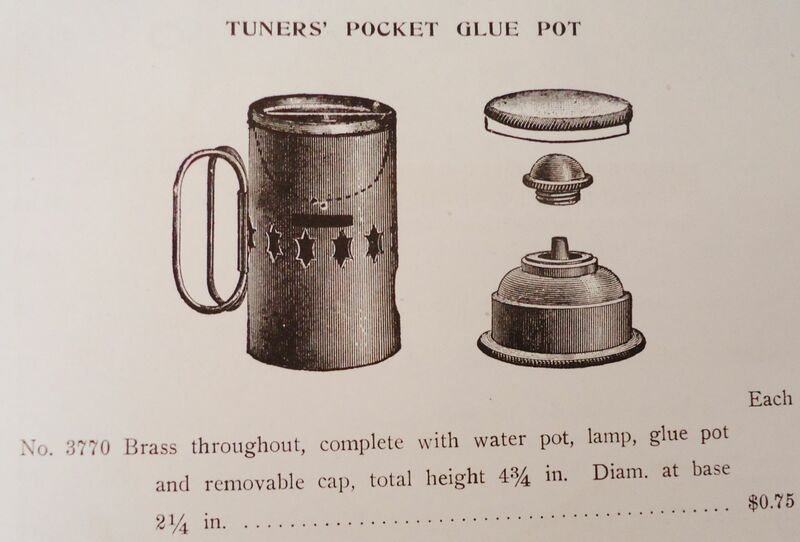 And deluxe brass glue pot combination. 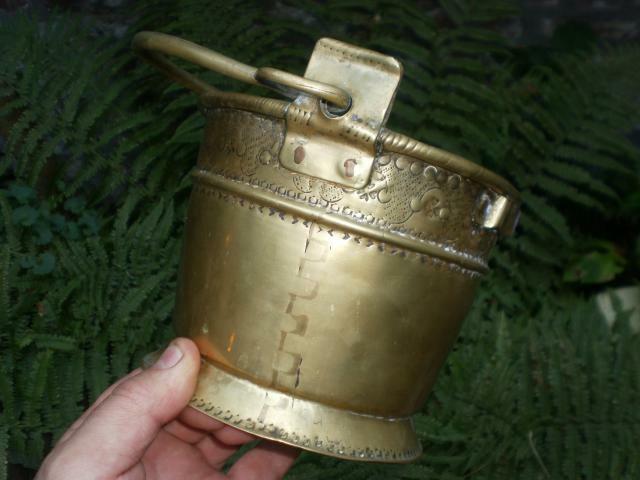 Tuner’s pocket glue pot, 4 13/4″ high, brass, showing burner separately. American Felt Co., N. Y., 1914. 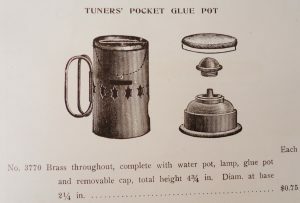 Two very small tuner’s portable glue pots. One brass and the other, steel. Higher view, showing tinned copper glue pot. Below that, these have a reservoir for water. Rustic and small copper glue pot, probably English. Copper conducts heat very efficiently, and also inhibits glue spoilage and mold, functioning as a biocide. Rust from the iron glue pots can really stain the glue; with copper glue pots, this is not a problem. 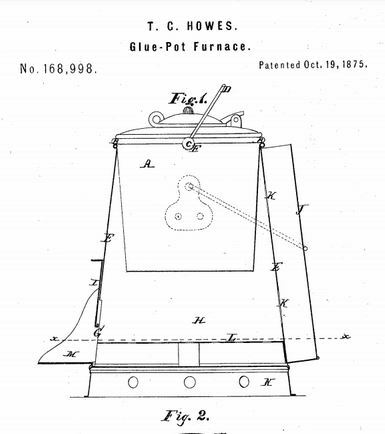 Small 3 inch cast iron glue pot patented by Thomas C. Howes on April 16th, 1872. 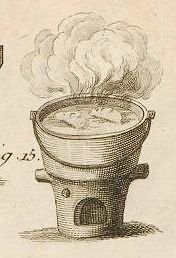 The tongue-like protuberance from the inner pot was included in the patent to serve as a fulcrum for the lid. 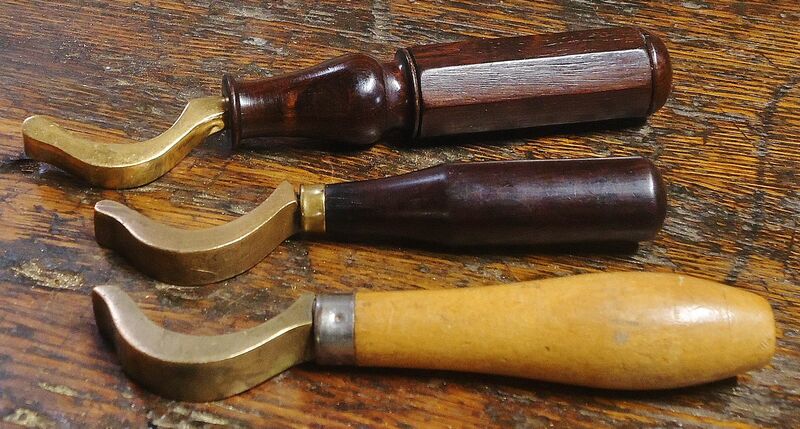 In actual practice, the extension serves as a handle, as well as a sort-of spout from which to pour the glue. 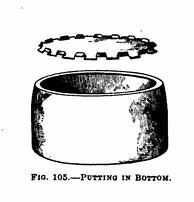 Most of the relatively few lids manufactured for the 1872 pot have been lost. 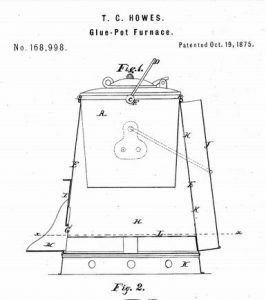 Line up of Thomas C. Howes glue pots. 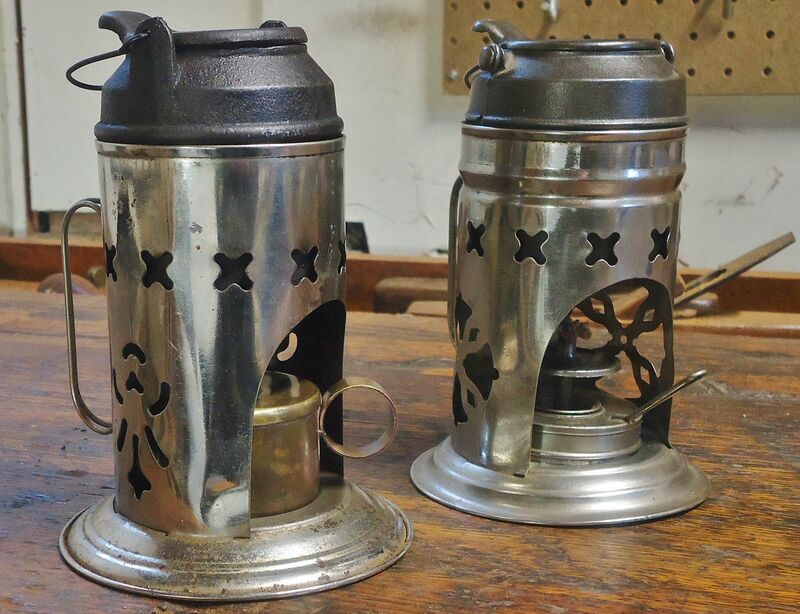 Original version showing the 1872 patent is on the left, including the elusive lid; Unmarked copy of the 1872, with extended handle flanges is next; Landers, Frary, and Clark 1875 version second to right, showing the April 16, 1872 patent on label; Buffum Mfg. version on right, which is smaller and has a rivet for the lid instead of a hinge. Fanner Mfg. 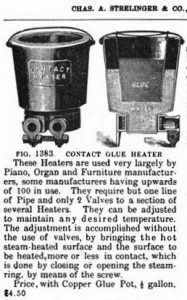 Co. in Cleveland, Ohio also made copies, and Lee Valley make a stainless steel version presently. 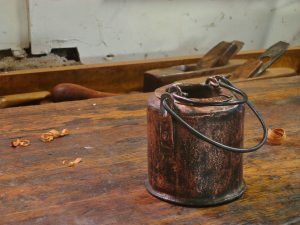 Final iteration of Howe’s glue pot, now with a true hinge for the lid. And the furnace, with flue. 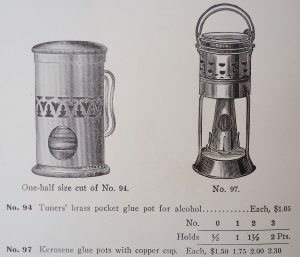 Other patents for ‘improvements’ in glue pots before 1900. Landers, Frary, & Clark glue pot in period heating shroud with alcohol lamp, next to French glue pot. 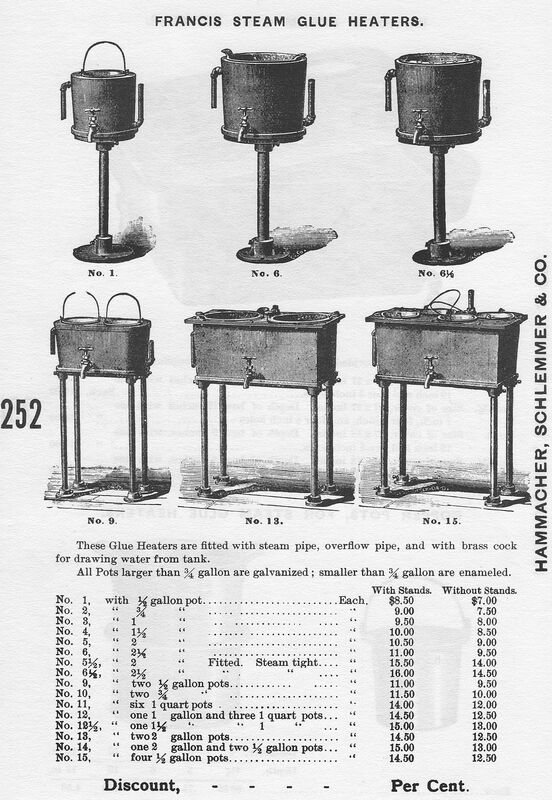 Steam tables, for groups of factory pianoworkers using hide glue. H.S. 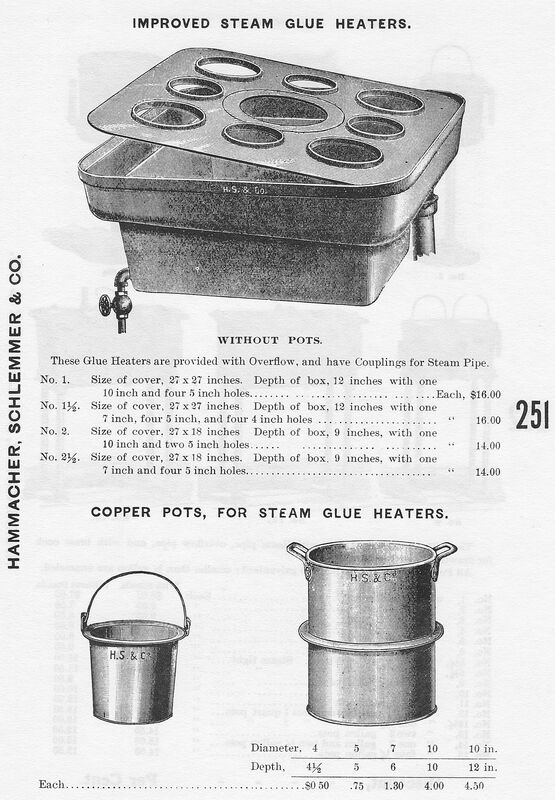 & Co., N.Y. catalogue 1885. Photo courtesy of Federicio Ponchia. Heating unit for three glue pots. Glue pot with heating shroud, intended for use with an alcohol burner, and glue pot originally set up for use with a kerosene burner. Alcohol burns cleaner than kerosene, hence the open arrangement for ventilation. H.S. & Co., N.Y., circa 1900. 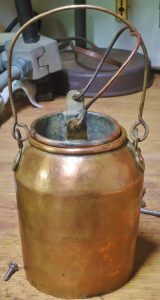 “Glue Pot.– A glue pot recently perfected consists of a circular kerosene lamp, made of tin, resting upon a tin bottom 8 1/2 inches in diameter. 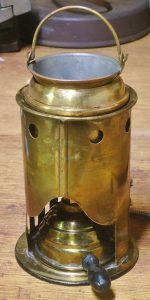 The lamp is fitted with a tin chimney in place of glass, and fitted with a small aperture, covered with mica, so as to see how to regulate the flame. 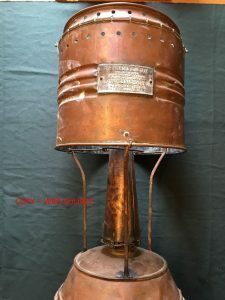 The glue pot is made of copper, tinned on the inside and supported upon a rim setting up about six inches from the bottom of the lamp, the rim supported by three legs, soldered and riveted to the rim and bottom of lamp rest. 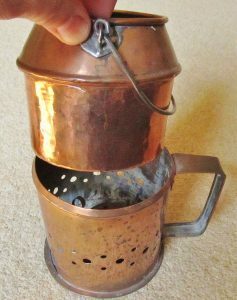 The pot in which the bottom is placed has a portion of the bottom arched, to give more heating surface, and connecting with the chamber under the pot is a flue, passing out and up alongside of the pot, which carries off any smoke from the lamp, and also acts as a draft to the flame. This pot is five inches in diameter, and about six inches high. The pot for the reception of the glue is set in the same as an ordinary glue pot, and will hold about a quart of glue. The whole can be carried to any place where you wish to use it, and still have the heat kept up. The cost of oil is but a few cents a week. 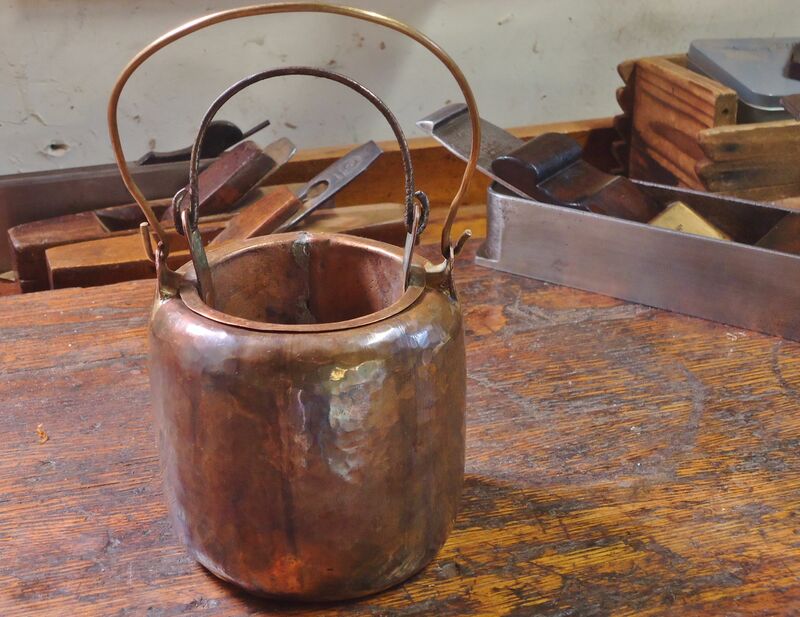 Another improvement is in the pot being of copper, tinned. 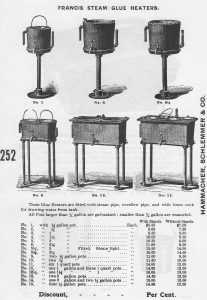 It will not corrode and spoil the glue, as is the case with iron.” From “The Practical Cabinet Maker and Furniture Designer’s Assistant,” written by Frederick Thomas Hodgson in 1910. 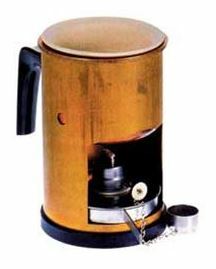 Kerosene was much less expensive than alcohol fuel, which can get pretty costly when used on a regular basis. Photo courtesy of Federicio Ponchia . 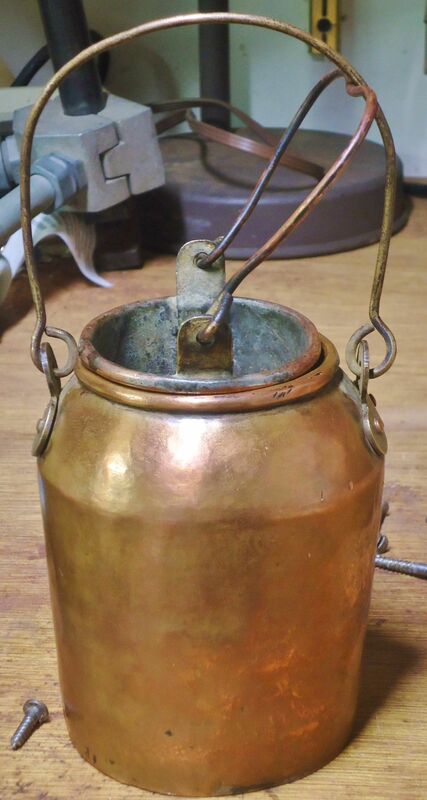 Kerosene lamp glue pot, with intact mica window for observing and regulating the flame. Photo from Donnelley Auctions in 2007. Morandi glue pot. Charles Strelinger & Co., Detroit Michigan catalogue, 1897. 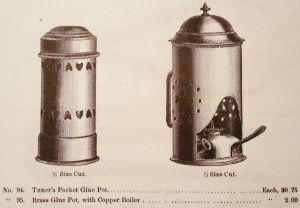 The Wetmore glue pot, manufactured by the Advance Machinery Co., Toledo Ohio. Photo courtesy of Federicio Ponchia . Photo courtesy of Federicio Ponchia . 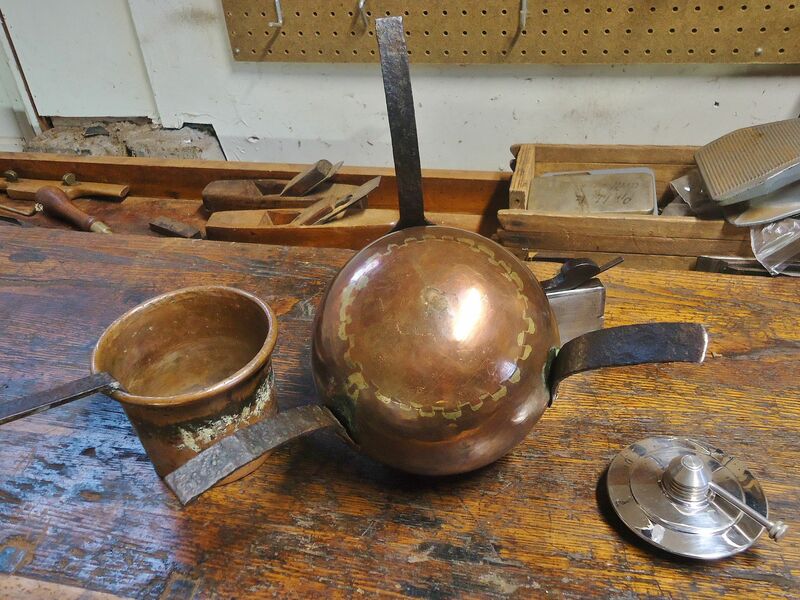 Open glue pot setup, with hand-hammered copper double boiler, brass stand, and adjustable burner. 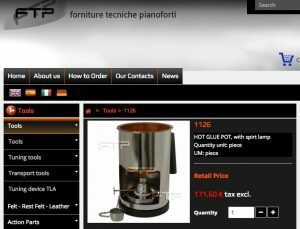 The globe-shaped Bain Marie glue pot is a French design. 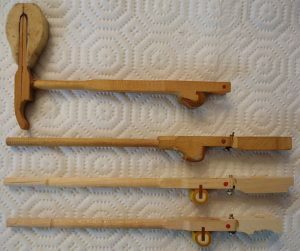 Un accessoire très utile pour les marqueteurs, ébénistes et les luthiers. Et les travailleurs de piano. Glue pot in stand. Photo courtesy of Federicio Ponchia. Gas stoves were also used to heat glue in a factory setting. H.S. & Co., N.Y., circa 1900. 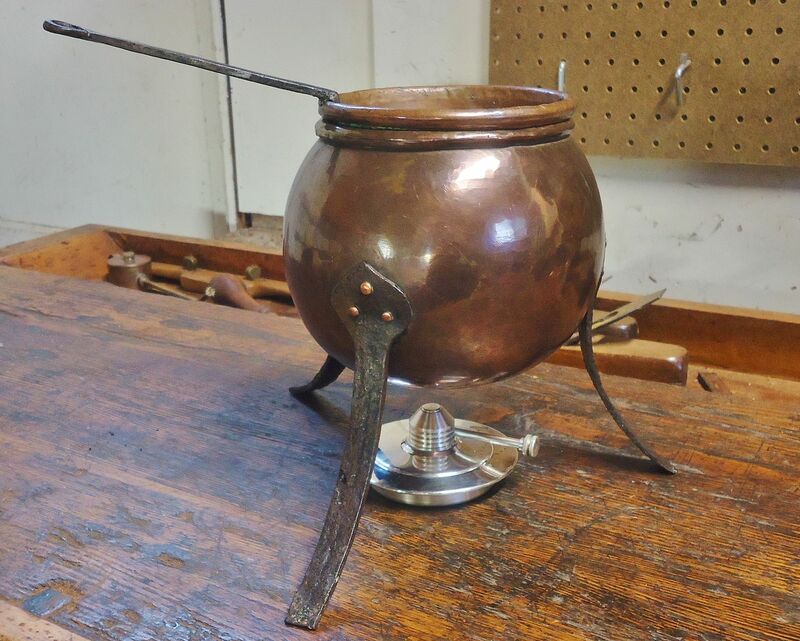 Globe style copper glue pot, with double boiler and three wrought iron legs. Its a French design. From “L’Art Du Menuisier,” by André-Jacob Roubo. Published in 1774. As seen in the cross section, the French glue pot had arrived at its final form, with double boiler and wrought iron legs. 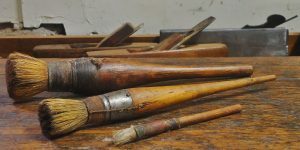 Also show are two hide glue applicating brushes, made of hog hair bristles, and attached to handle with wrapped cord instead of a metal ferrule, in order to avoid staining the glue. 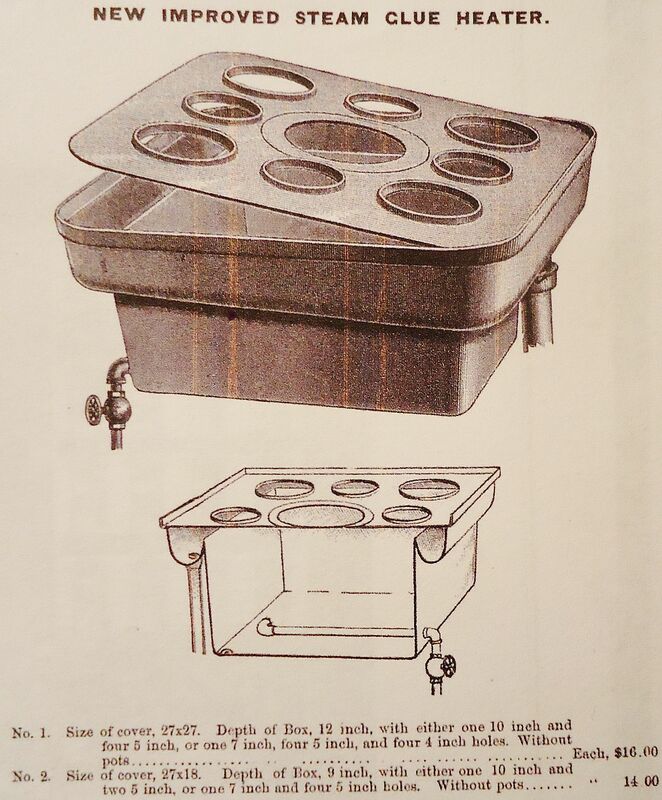 The long legs allow enough room to place a burner underneath it. Steel glue pot with legs, smaller type. French. 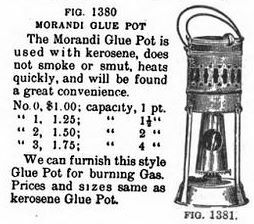 With short feet, this glue pot was designed to sit on a stove, which probably also heated the workshop. It is borne out by the blackening of the bottom, which hides the dovetailing. Coal stoves and wood stoves heated the hide glue and the workshop space. French glue pot, 4 3/4 inches tall. 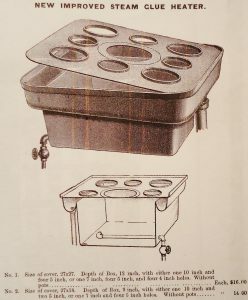 The lip on the upper perimeter of the outer pot would indicate that it was originally intended to sit within a stand, or on top of a heating shroud. French origin, outer pot is 3 3/4 inches tall. Milk bottle style, with tinned inner pot. French. Heavy European copper glue pot, with hammered exterior. Classic glue pot design. Copper glue pot is also dovetailed. 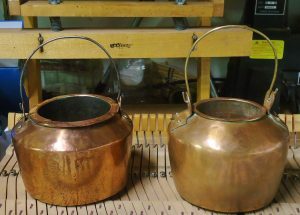 Body is similar, if not identical to copper tea kettles made in the early to mid-19th century. “Glue pot and tea-kettles: Glue pots may be considered as the stepping-stones to tea kettle making, as the bodies are made the same size and way, and if a boy (or man either for that matter,) will take the necessary care and interest while being instructed in the work of making glue pots, he may attain the proficiency necessary to execute the best work, such as is demanded for bright goods. 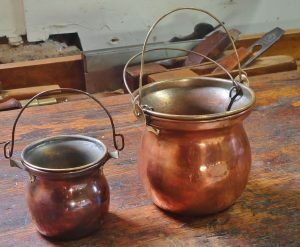 Let us begin to make two round bodies, the same as for 1-gallon glue pots and at the proper place we will branch off, finishing one a brown glue pot, and the other a bright tea-kettle, following throughout the methods in vogue when the coppersmith made his own mountings” –From “Art of Coppersmithing,” by John Fuller Sr., 4th edition, 1911. 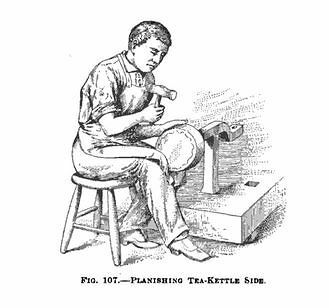 John Fuller apprenticed in a coppersmithing shop, at the the age of nine, in 1842 in the town of Dorking, Surrey, England. 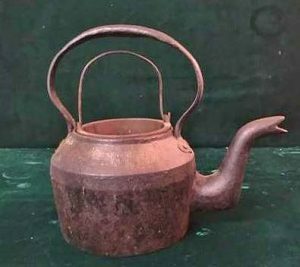 He described how coppersmiths made their wares, at a time–up to around 1884 he explained later–of utilizing traditional methods with hand-made forms and mountings. “Art of Coppersmithing,” John Fuller 4th edition, 1911. 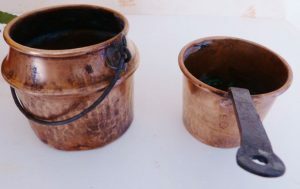 Two gluepots in the early 19th century teapot style, showing dovetailed bottoms. One bold, the other, subtle. 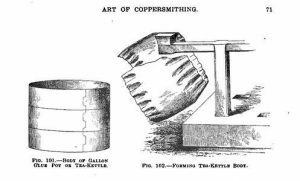 “Art of Coppersmithing,” John Fuller 4th edition, 1911. Finished glue pot. Two variations of the teapot pattern. 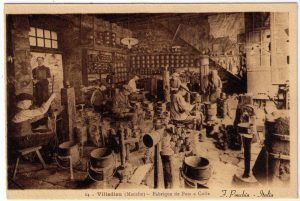 Coppersmith’s workshop devoted to making glue pots in Villedieu, France. In the Normandy region. Workers were commonly deaf or hard of hearing from all the hammering involved in making copper goods. Its ironic that the copper glue pots were destined for the many instrument makers and piano factory workers in France, yet those who made them were deaf. Of course, these pots were in demand from other crafts, such as cabinet makers, and restorers. Image from Federicio Ponchia. 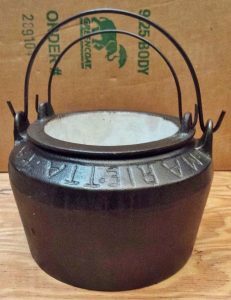 Traditionally designed cast iron Marietta glue pot, with white enamel or porcelain lined inner pot, to prevent glue staining. 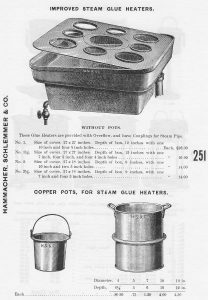 Made in great quantities by Marietta Mfg. Co., in Marietta, Pennsylvania. 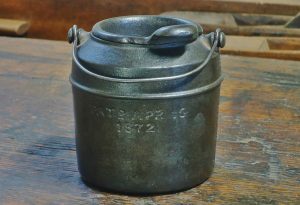 Kenrick & Sons, in England, also made many cast iron glue pots of a similar profile. 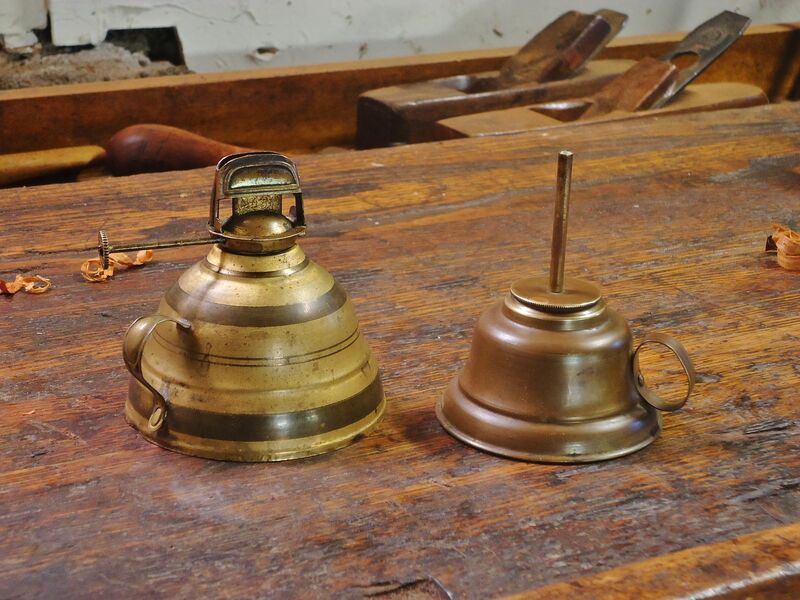 Archibald Kenrick started a foundry in West Bromwich, U.K., in 1791, and Kenrick Co. is still in business today. 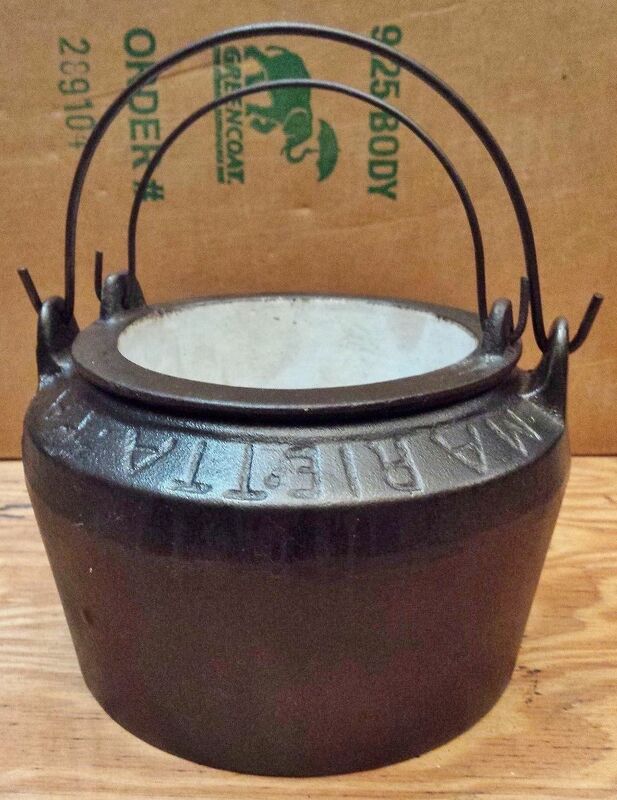 Warning: antique cast iron and enamel lined cookware from the the old Marietta foundry, and others, may contain lead in both the iron (to enhance malleability) and in the enamel. For glue pots and gluing purposes this would probably not be a significant issue. French copper glue pot, with mizusaji glue spoon inside inner pot, showing how small it actually is. 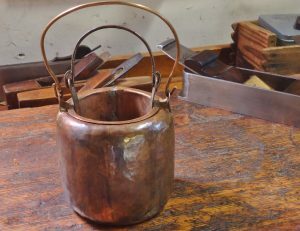 And a rare English cast gunmetal (bronze) glue pot. Both are under four inches high. Ancient Egypt: Craftsman preparing glue–glue pot is over a fire, and craftsman painting a board. Dionysius of Fourna, an Eastern Orthodox monk, wrote a manual of iconography “Hermeneia” between 1730 and 1734. Hermeneia included the following instructions on preparing hide glue from scratch. This material was taken directly from the Emily Carr University of Art and Design in British Columbia, Canada website. “This method [Dionysiyus’] of preparing glue was used up to the beginning of the 19th century, and in some places even later. Since that time, glue has been produced industrially. Repeat the last two steps three to four times to extract all of the glue from the hides and bones with the temperature increased (20-25° F.) each time. 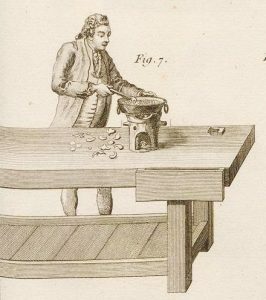 Illustration of a lead glue pot from “The Art Of Joinery,” by Joseph Moxon, circa 1703. One would have to be careful to avoid melting the lead as a result of placing the pot too close to the flame. 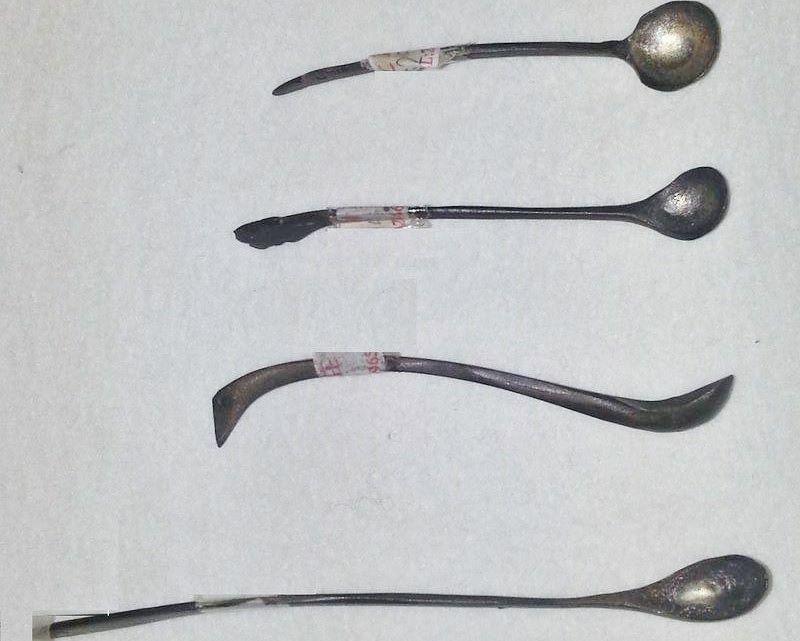 Lead was used for its superior ability to conduct–and hold, heat. 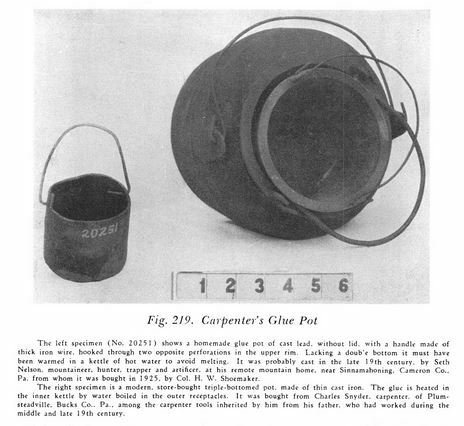 “The Carpenter’s Glue Pot. (Fig. 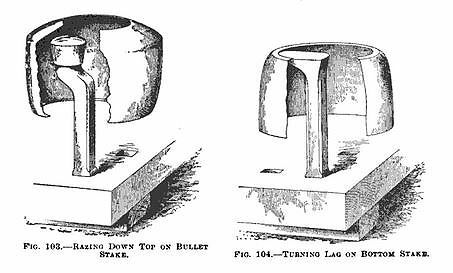 219) an original, homemade example of which, constructed of lead for extra heat retention, as described by Moxon, is here shown. No. 20251. Still earlier than Moxon, in the “Probate Records of Essex County, Massachussetts, 1635-1681, 3 vols., George Francis Dow, editor. Salem Mass. 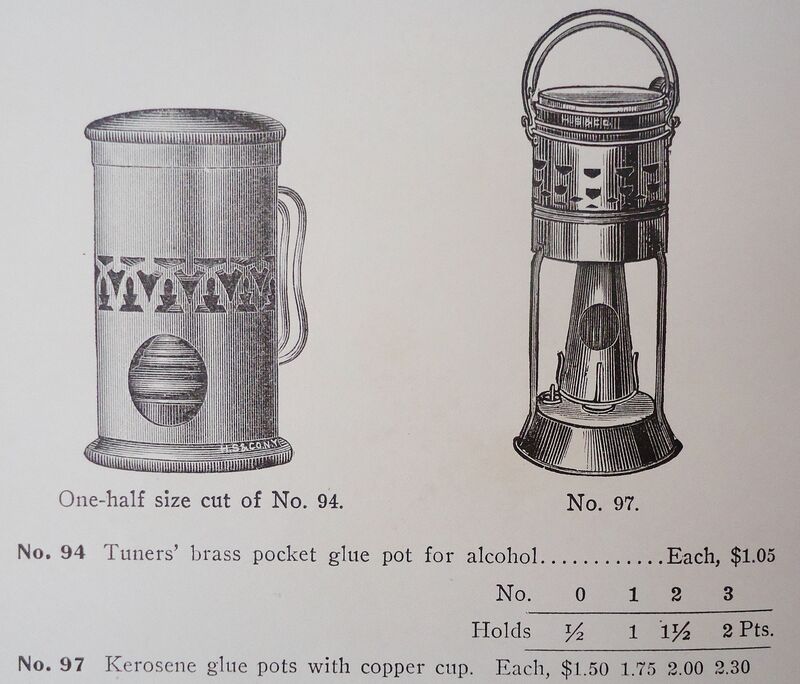 The Essex Institute, 1916-1920, the carpenter’s glue pot is appraised at 1 shilling, in 1644, and at 1 shilling, 6 pence, in 1675. 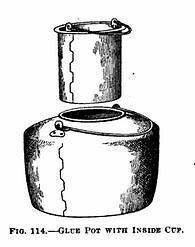 In these cases it seems unlikely that the glue pot could have been made thus cheaply of expensive lead, neither could it have been double-bottomed, as described in “The Circle of Mechanical Arts,”, by Martin, who, writing in 1813, says that the double-bottomed glue pot had just then come into use in England. 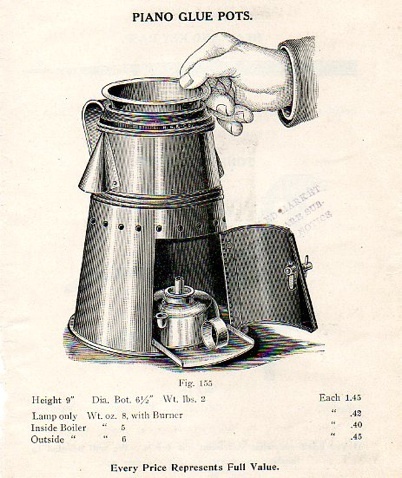 The illustration also shows one such pot, factory-made, in three compartments, of cast iron, enclosing an inner receptacle of heat retaining alloy, of date about 1870, resembling in construction those now in use [1925-1929], in which the glue, in this inner kettle, escapes scorching by being heated by water boiled in the outer compartments.” From “Ancient Carpenters’ Tools,” by Henry C. Mercer in 1929. 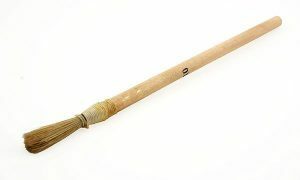 Traditional string wrapped glue brush with hog’s hair bristles, string-wrapped instead of a metal ferrule in order to prevent staining the hide glue. This becomes more salient when joining lighter colored woods. 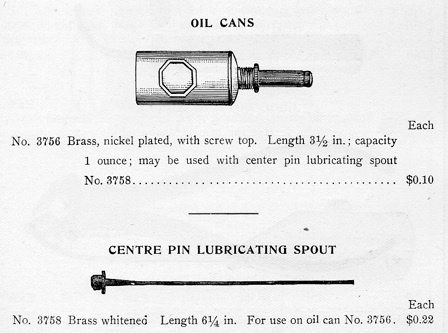 Traditional glue spoon illustrated in “Modern Practical Joinery,” by George Ellis, in 1908. Large copper glue spoon and smaller tin glue spoon. 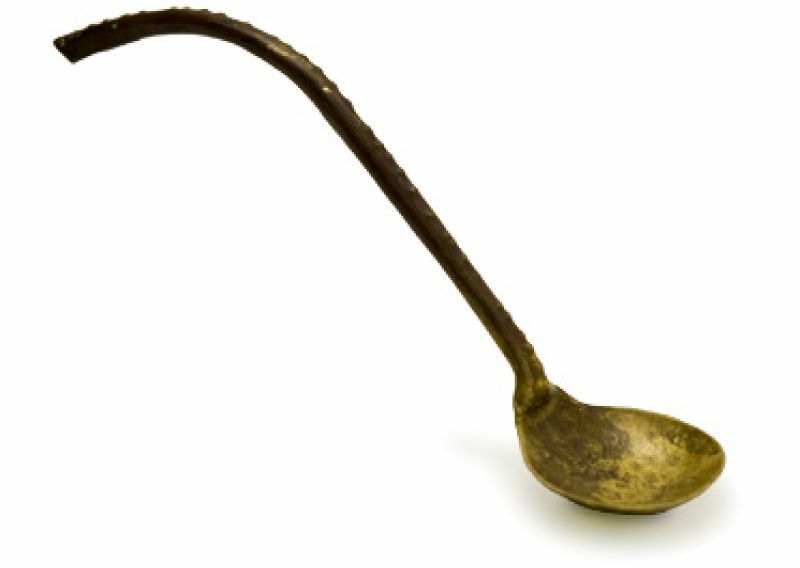 “Mizusaji.” Japanese brass hide glue spoon, with characteristic curved and decorated handle. 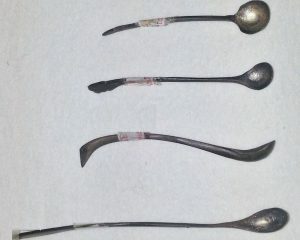 Various Japanese glue spoons. Photo from internet source. New lamp glue pot available from FTP. Another version, brass body, and ceramic glue pot. 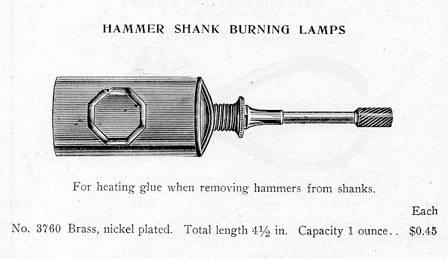 Standard hammershank burning lamp, H.S. & Co., N.Y., c 1900. Classic alcohol hammershank burning lamp. 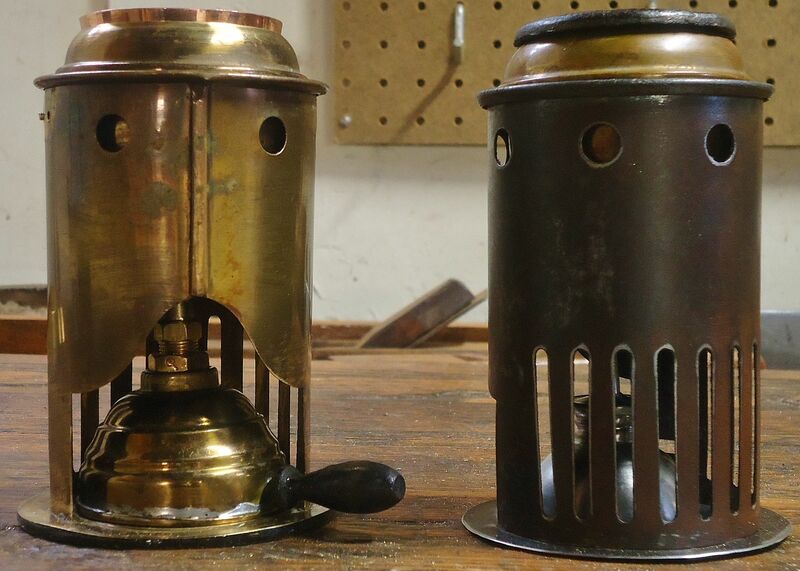 Two older burn-over piano lamps, with leather gaskets. Portable tuner’s hammershank alcohol “burn-over” tool. For bending wooden grand hammershanks. Very commonly used after hanging sets of hammers on new or old shanks. From Hammacher Schlemmer piano supply catalogue, c. 1903. 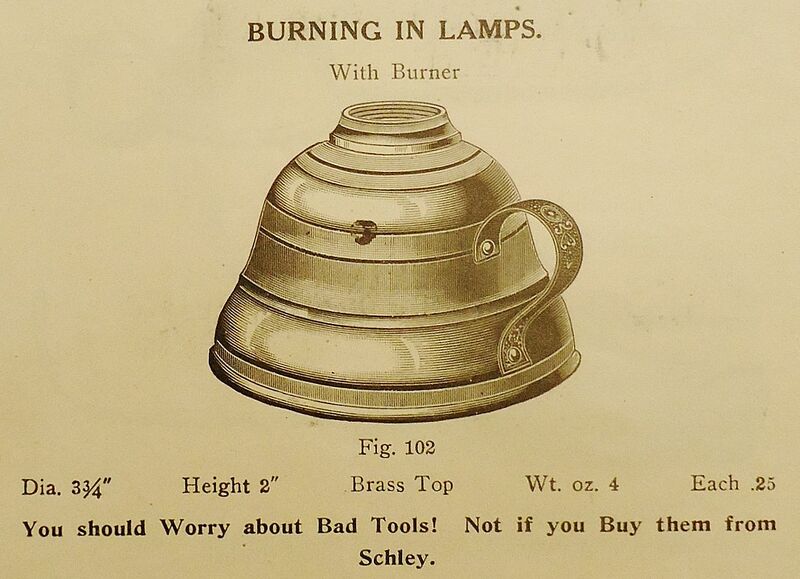 Another hammershank casting lamp design, circa 1915. Tuner’s Supply Co., Boston, MA, circa 1930. 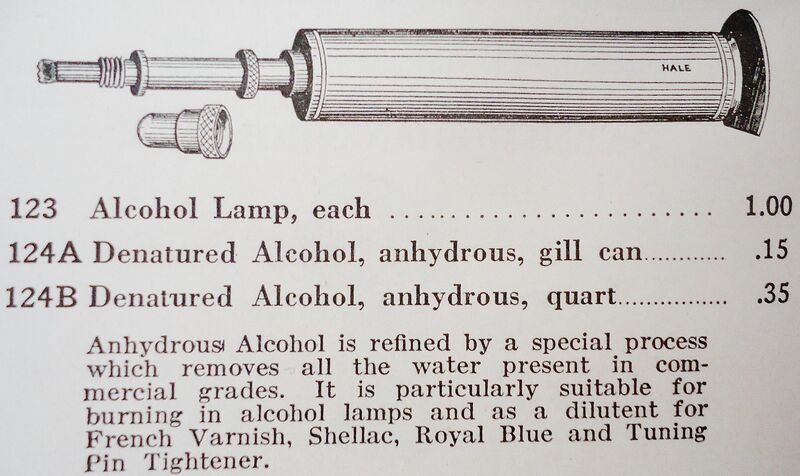 Tuner’s portable alcohol lamp. American Felt Co. 1911. 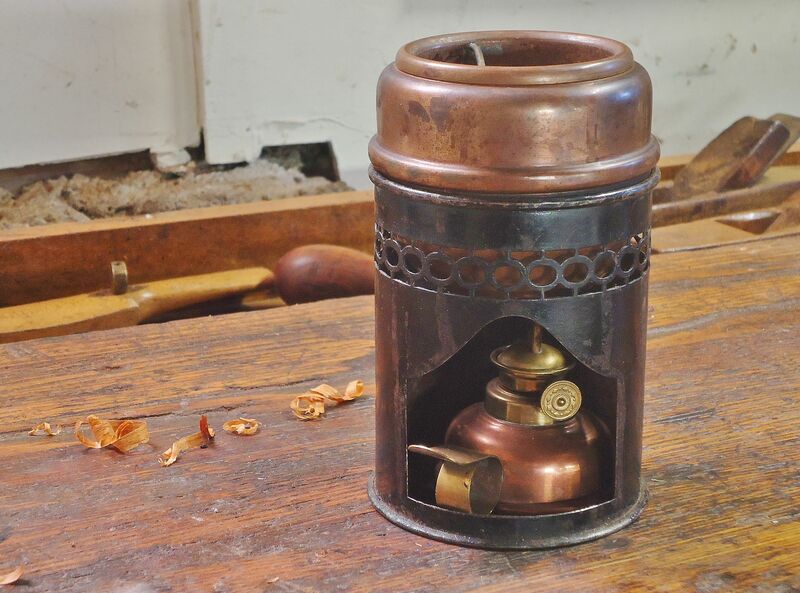 An alternative spout would convert this oiler into a hammer-shank burning lamp, using alcohol as fuel. 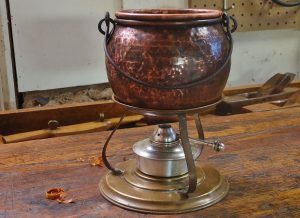 Alcohol lamp, for cabinet finish burn-in repairs, heating a large glue pot, or heating wooden hammershank bending pliers. 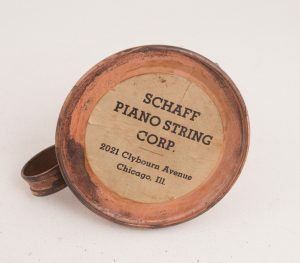 From Schaff Piano String Co., Chicago, IL, circa 1915. 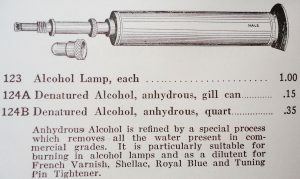 Bottom of Schaff alcohol lamp. Cap and wick not shown. Schley pianomaker’s catalogue, 1905. 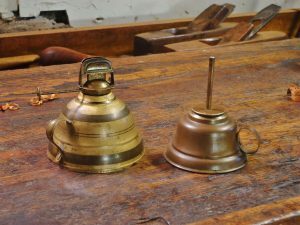 Two 19th century finger lamps. 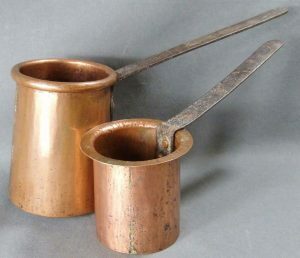 Left one is similar to the illustration above, and would work well for heating the burn-in knife, or spatula. This lamp would also be used for ironing or steaming hammers with a hammer iron, or heating upright hammer shanks with shank bending pliers. H.S. & Co. N.Y. circa 1895.